Moldavite is a variety of tektite, a natural glass formed by a meteorite impact melting the soil and rock, ejecting it into space. The molten liquid then falls back to earth and cools down forming glass. Moldavite is named after the river Moldau, Czech Republic, where it was first discovered in 1787. 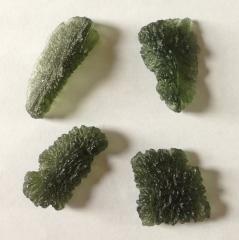 Moldavite, a deep green silica based tektite that fell to earth about 15 million years ago, aids alignment with higher Self, it assists meditation and is said to aid in channelling extra terrestrial and inner dimensional sources.A good balancer of mind and body, a general if soft all round tonic for the body and spirit. Moldavite is associated with the Moon, the planets Mercury and Pluto. Moldavite activates Anahata, the Heart Chakra ( 4 ) and to a lesser degree Manipura - the Solar Plexus Chakra ( 3 ).